On July 11 Kurdish forces took control of the main oil fields surrounding Kirkuk, a move that could bolster a potential bid for independence. The Kurdish Regional Government (KRG) announced its decision, claiming that it did so in order to thwart a plot to sabotage key oil fields and a major new pipeline connecting them. Only, the intriguing detail disclosed was not that the oil fields were under threat from the militant Sunni group ISIS, but from the central government in Baghdad. The KRG accused the Iraqi government of ordering oil workers to reinject oil back into a field, which would have made it inaccessible. The Oil Ministry also told personnel to “dismantle or render inoperable the valves on the new pipeline,” the KRG said in a statement on its web site. To avert the plot, the KRG says, it seized control of the oil fields. 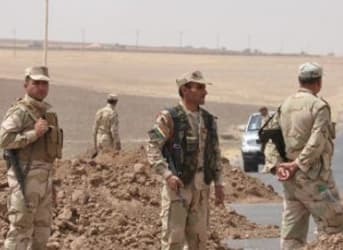 “This morning, members of the Kurdistan Regional Government (KRG) and Kirkuk Oil Protection Forces moved to secure the oil fields of Bai Hassan and the Makhmour area, after learning of orders by officials in the federal Ministry of Oil in Baghdad to sabotage the recent mutually-agreed pipeline infrastructure,” the KRG statement said. Now under Kurdish control, the KRG says the fields will continue producing normally. Despite the turmoil in Iraq since the advance of ISIS, oil production in regions under Kurdish control has continued unimpeded. In fact, oil output in Kurdistan actually increased in June, jumping by more than 50 percent. Oil workers at the Kirkuk oil fields were told to comply with KRG orders. “Staff at the North Oil Company that previously operated these fields have been informed that from tomorrow they will be expected to cooperate with KRG management. Those who do not want to do so can leave,” the July 11 statement said. If true, the plot by the Iraqi Oil Ministry was likely intended to deprive the KRG of oil revenues and to setback Kurdistan’s efforts at unilaterally exporting oil through Turkey, which Baghdad views as illegal. Perhaps, fearing the loss of control over oil infrastructure far from Baghdad, the central government wanted to render much of it inoperable. However, intentionally damaging pipeline infrastructure and disposing of oil in an area where Kurdish forces are vastly superior to their Iraqi counterparts would be counterproductive, to say the least. In fact, such a scorched-earth policy would only justify more aggressive moves by the Kurds, and to some extent give them a pretext to break further from the state of Iraq. And given the swift action taken by the KRG, the Oil Ministry’s decision to sabotage oil infrastructure would appear to be a severe miscalculation. With the Kirkuk oil fields under Kurdish control, the KRG hopes to significantly increase oil production. It already has set a goal of achieving 400,000 barrels per day in exports by the end of the year. The KRG said oil from the Kirkuk fields will be used to replace the loss of refined products from the massive Baiji refinery, which has been offline since June 17 due to an ISIS assault on the complex. The KRG also said that it will use the revenues from the Kirkuk fields to replace the 17 percent share of national revenues that Baghdad has refused to send, which is guaranteed under the Iraqi constitution. In this sense too, Baghdad seems to have overplayed its hand. With new sources of revenue, the Iraqi government has strengthened the KRG’s ability to stand on its own. To be sure, the reports of a plot on behalf of the Iraqi Oil Ministry come from the KRG, which would have a certain incentive to exaggerate the degree to which the Iraqi government was conspiring. Whether or not the plot was real, it doesn’t matter at this point. The KRG has made its move, and it is one that could hasten an independent Kurdish state.